Part III: Turning Heads opens Oct 10 2015, with an opening reception and curator’s talk on Oct 17, 2015. 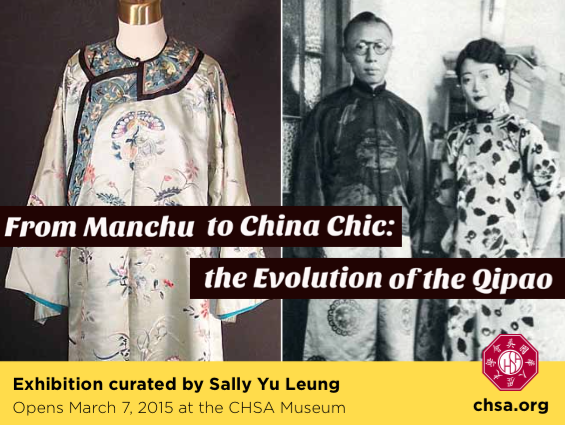 Curated by Sally Yu Leung, From Manchu to China Chic: the Evolution of the Qipao, it features outfits from 1890s to 2000s along with accessories, posters, and period images on loan from prominent private collections. The qipao, known as a mandarin gown or cheongsam, has a hybrid design combining elements from Han Chinese, Manchu and Western clothing. The term qipao refers to a traditional garment that was transformed into a slender, form-fitting dress in Shanghai, known as the Paris of the East. After the downfall of the Qing dynasty, the qipao was made fashionable by socialites. With the founding of the People’s Republic of China in 1949, living a simple and thrifty life became the norm, and the qipao experienced a vacuum in fashion. Chinese communities outside the mainland (Taiwan, Hong Kong, the United States) have ensured its continuity where it became the ‘national dress.’ During the Cultural Revolution (1966-1976), anyone wearing a qipao would be accused and even persecuted for pursuing a bourgeois lifestyle. By the 1980s the qipao made a resurgence, with bright colors and patterns as stylized by designers in Shanghai.